Tony Richardson and Dustin Keller of the NY Jets give out "shadow buddy" dolls to pediatric patients at Woodhull Medical Center. 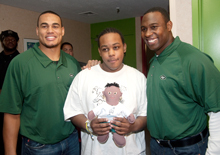 Brooklyn, NY ― As part of the world-wide Shadow Buddies program, pediatric patients at Woodhull Medical Center received a new buddy thanks to the collaborative efforts of friends and former teammates, New York Jets Tony Richardson and Atlanta Falcons Tony Gonzalez. Shadow Buddies are condition-specific dolls (called buddies so boys can relate to them as well) given to seriously ill children and medically challenged children and adults to help them cope with specific medical conditions. Mr. Richardson handed out 100 “Tony Richardson Buddies' today in the pediatric in-patient unit at Woodhull Hospital. These special “buddies' were dressed in shorts and a t-shirt with Mr. Richardson's #49 screened on the back of the shirts. "It's my pleasure to partner with Tony Gonzalez and Shadow Buddies helping children in need here in New York. Shadow Buddies help nurture the human spirit and give children hope during a difficult time," said Tony Richardson. In recognition of Woodhull”s reputation as a leader in the fight against childhood asthma in Brooklyn, one of the buddies Mr. Richardson brought with him today was Respiratory Buddy who comes with an inhaler to help children going through asthma treatments. “We are very grateful that the Shadow Buddies Foundation has developed a creative way to help young patients cope with their challenging medical issues, and we are delighted that Woodhull Hospital has been selected to distribute their newest addition, the “Tony Richardson Respiratory Buddy” to help our young asthma patients,' said Iris R. Jimenez-Hernandez, Senior Vice President for the Woodhull North Brooklyn Health Network. Joining Mr. Richardson today was Ms. Marty Postlethwait, CEO and Founder of the Shadow Buddies Foundation. Ms. Postlethwait”s son, Miles, was born with multiple medical challenges and inspired the creation of Shadow Buddies. "Shadow Buddies are a great teaching tool for child life specialist. They help children relate to their specific illness and let them they're not alone. Most important are buddies are not about finding a cure, they are about providing hope to sick children,' said Ms. Postlethwait. Both NFL players, Tony Richardson and Tony Gonzalez, are committed to donating 250 Shadow Buddies each to Woodhull Medical Center over the course of 2010. Atlanta Falcons Tight-End, Tony Gonzalez, has worked hand in hand with the Shadow Buddies Foundation for the past 14 years and recently he approached his good friend New York Jets Fullback, Tony Richardson about joining together to bring Shadow Buddies to the special children at the Woodhull Medical Center located in Brooklyn. Richardson was eager and excited to team up with Gonzalez and the Shadow Buddies Foundation. In addition to Shadow Buddies, Tony Richardson is very involved in his own foundation, the Rich in Spirit Foundation. Created in 1999, the Rich in Spirit Foundation extends a helping hand to uplift the lives and spirits of individuals whom society has turned its back on, with particular attention to enhancing personal growth in children. Since the Foundation”s inception, Mr. Richardson has personally donated more than $1 million and made more than 1,000 appearances. In 2010, The Shadow Buddies Foundation will be celebrating its 15th Anniversary. Since 1995 the Foundation has distributed more than 780,000 buddies to medically challenged children in need throughout the world. For more information on The Shadow Buddies Foundation please visit their website: www.shadowbuddies.org or call 913-642-4646. Woodhull Medical Center is a 411-bed acute care hospital in Brooklyn, serving the neighborhoods of Williamsburg, Bushwick, Greenpoint, Fort Greene, and Bedford-Stuyvesant. Woodhull offers culturally competent, sensitive care, and translation services in multiple languages. It serves as the anchor for the North Brooklyn Healthcare Network, encompassing 16 community-based health centers, and is a member of The New York City Health and Hospitals Corporation (HHC), the largest municipal hospital and health care system in the country. Woodhull also is affiliated with the New York University School of Medicine. The New York City Health and Hospitals Corporation (HHC) is a $6.7 billion integrated healthcare delivery system with its own 420,000 member health plan, MetroPlus, and is the largest municipal healthcare organization in the country. HHC serves 1.4 million New Yorkers every year and more than 475,000 are uninsured. HHC provides medical, mental health and substance abuse services through its 11 acute care hospitals, five skilled nursing facilities, six large diagnostic and treatment centers and more than 70 community based clinics. HHC Health and Home Care also provides in-home services for New Yorkers. HHC was the 2008 recipient of the National Quality Forum and The Joint Commission's John M. Eisenberg Award for Innovation in Patient Safety and Quality. For more information, visit www.nyc.gov/hhc or find us on facebook.com/nycHHC or twitter.com/HHCnyc.